GPS is still "bleeding edge" technology and one area in which this is apparent is the lack of data cables for the Macintosh. Except for the latest units which have USB connections, many data cables provided by GPS vendors are "unterminated" (meaning raw data cable strands); or terminated in a PC style DB-9 connector. In general, we recommend that you purchase the standard PC data cable for your GPS unit from your dealer; and use it with the Keyspan USB GPS Adaptor (below). This gives you the most flexibility in the long run as you can switch GPS vendors or use a PC power+data cable in conjunction with the adaptor. For USB-only Macs, see our FAQ on GPS/USB connectivity. You'll need a serial to USB converter or a serial PCI board to hook up your GPS unit. We recommend the Keyspan USB PDA Adaptor (see below) in conjunction with the standard PC data cable sold by your GPS vendor or our eTrex/eMap data cable. Works with our eTrex cable for Garmin eTrex/eMap Series GPS. This cable mates with Garmin, Eagle/Lowrance, and Magellan's "PC Interface Cable" or "PC Interface Cable with Cigarette Lighter Adapter" for their series of GPS units. Is the best solution if you wish to use a manufacturer's Data/Power cable with your GPS to supply power (cigarette lighter/etc.) while using your unit with GPSy. Purchase the manufacturer's PC Data/Power cable from your GPS reseller (verifying it has a standard PC female DB-9 connector) and then use this Generic PC-to-Mac data cable adaptor to convert it to the Mac's Mini-Din8. Please note that while there are many cables that look the same as this cable, they usually will not work due to wiring differences. We are not currently aware of any off-the shelf cable that works without modification. The Palm Adaptor is the closest, but you still need to modify it. Most off-the shelf will simply not work otherwise we wouldn't be selling this. 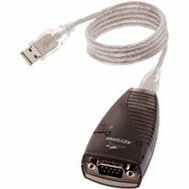 Bundle Price: Purchase the Generic PC-to-Mac Cable, GPSy CD-ROM, and GPSy together for only $75 with 2-day shipping (normally $100; save $25). We've had hits since its creation on March 27th, 1997. This page was last updated on 1 June 2006.